I know most of this info has already been posted but I'm just re-confirming. Refurbished cars status update. Some cars have little information attached to them while others do have lots of info. I'm hoping to go by Russell this week. 4237 is not refurbished but remains on property. The pole is tied down but it isn't stripped. Last track to the west. Viewable from Minto St.
4214, 4247 and 4251 are all still at Russell, in states of stripped. 4215 and 4217 have had their trump units harvested. Not all of these dates may be accurate, for example 4217 was reported in the fall as being service on the 501 while tracking in Lake Ontario. I also discovered recently that TransSee deletes vehicle history data after a while, so that's unpleasant too. My last ALRV was 4204 on January 19. What is a trump unit? Interesting that in that photo of 4210 at that link from November 2018, the car had its lights on despite being parked in that spot for months on end. 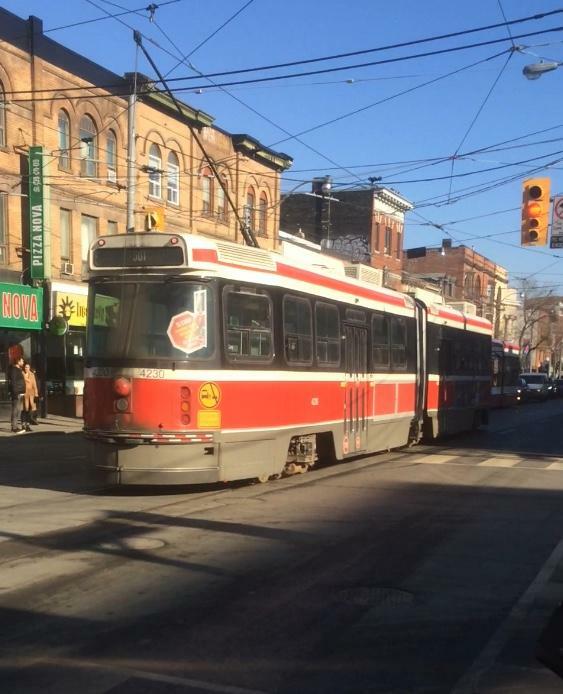 Is that not a waste, to keep a dead streetcar lit up? The post just says “... sleep well 4242. Thank you for your service.” There no indication of it scrapped as of yet. Are they? Don't call out places as that could and will ruin the chances for any to be preserved. It's been previously confirmed in this thread that Seashore are interesting in acquiring a CLRV. There was a longstanding rumour that they wanted one of the three that went to Boston, but with 4029 being as shabby as it is and the other two long gone I'd be surprised if that was the one they ended up going for. It's been talked and bandied about for years, probably since the three cars ran in Boston, so it's far from being top secret, eyes only stuff. Anyways, on the subject of off-TTC operations, I was talking with some friends a while ago and one of them's convinced that a CLRV was demonstrated on the Shaker Heights line in Cleveland back in the day. Something about that sounds vaguely familiar like maybe the idea was contemplated at one point but I couldn't turn up anything online to conclusively prove or disprove it unlike the Boston and Swiss trials. Does anybody know one way or the other for sure? The post of 4242 is outdated. There's no evidence of it being scrapped. 4210 was on the last track (west) when I was at Russell. Trolley pole on 4210 was tied down. Catcher/receiver on 4210 has been harvested. I marked 4242 as being retired at the start of the month. I felt it was reasonable to conclude that it had been, based on its prolonged absence from service, as well as the number of ALRVs that were reported as being active in the service summary compared to what was still tracking. 4101 is tracking on 506 as of 0830 this morning. 4020 was also out on the 501 this morning. How did 4229 go from retired to active again? I realized it was never indicated as being stripped, plus the plans to put the ALRVs back in service mean that we don't actually know if that one will run again or not. Back when Toronto was first receiving the CLRVs in 1978, they sold 9 PCCs to Cleveland for the Shaker Heights line. Perhaps this is misremembered, or there was some talk back then of testing one of the CLRVs there. Should be some evidence if true. The Greater Cleveland Regional Transit Authority tested MBTA car #3401 on former interurban lines in mid-1976, but ultimately declined to purchase the US SLRV, instead buying custom LRVs of a different design from Breda. When Cleveland released a request for quote in September 1977, Boeing Vertol bid US$869,492 (equivalent to $3,600,000 in 2018) per SLRV, exceeding Breda's winning bid of US$645,833 (equivalent to $2,700,000 in 2018) per car. :221  SEPTA of Philadelphia, Pennsylvania was initially interested (especially because the SLRV would be locally produced), but purchased custom LRVs from Kawasaki because the US SLRV would not clear the City Hall loop. SEPTA tailored the bid by specifying the vehicle width to be 4 in (100 mm) narrower than the SLRV specification to exclude it from consideration. :95 The Kawasaki cars for SEPTA were assembled at the Boeing Vertol plant to meet "Buy America" requirements. I did a bunch of sleuthing around the internet and found this mention of an MBTA car test in Cleveland on Wikipedia. The US SLRV is visually quite similar to the CLRV (as the article mentions) so perhaps it's a case of mistaken identity. I haven't found any references to CLRV's being tested in Clevelnad, but the timelines do match up with Cleveland's purchase timelines so maybe it happened.